Downtown Phoenix Zombie Walk 3 - October 29, 2011 - Zombiewalk.com - Your source for all Zombie Walk and Zombie Flash Mob planning! 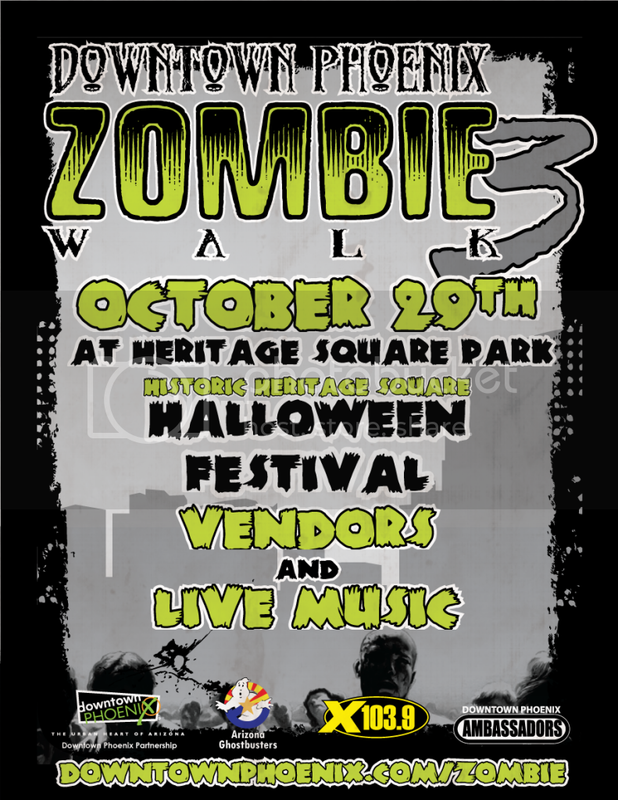 Phoenix, AZ - Legions of undead will converge in Downtown Phoenix for Zombie Walk 3 as part of a full cauldron of Halloween fun Saturday, October 29, 2011. The Downtown Phoenix Partnership and X103.9 present an afternoon and evening gathering with something for the entire family - from tiny ghouls on up to freakish adult Zombies. What do goblins and ghosts drink when they're hot and thirsty on Halloween? Ghoul-aid!!! And they'll be able to get so much more at the gathering at Heritage Square & Science Park. More than 2,000 walking dead showed up for the main event last year - the Zombie Walk. This year, for a donation of canned goods to St. Mary's Food Bank, all sorts can take part in the frightening stroll of the undead throughout Downtown scaring any and all who dare to unknowingly enjoy a peaceful urban night out. What they'll find is that the real entertainment will be streetside when families, decked out in scary or other Halloween fare, show their true and often bloody colors. For additional donations of canned goods, wanna-be Zombies can have their make-up done on site. The costume contest is no joke either. A celebrity judge will be scouting who to honor with prizes for the best fright sight or cute bundle of pumpkin fun. And who ya gonna call to lead the parade of the walking dead? Why the Ghostbusters, of course. Their Ecto-AZ ambulance and special Ghostbusting Proton Packs might just come in handy if any of the Zombies get out of control. For certain protection, the Phoenix Police Department and the Department of Zombie Defense will help keep the Zombies from consuming the human that might cross their path. What is a Mummies' favorite type of music? Wrap!!!!! Zombie walkers and Halloween revelers of all sorts will be treated to entertainment of all kinds - from bouncy houses, choo-choos and make-up artists for the kids, to Tarot card readings and a bit of rock n' roll featuring a few bands, including live Reggae, The Recovery Junkies and The Relics. Entire families will be able to tour the Victorian Rosson House as well. Actually, the ghosts gathered should head to the Rose & Crown for A Nightmare on Adams Street and for year two of its newly-expanded beer garden. Four Peaks is bringing their Draft Truck with seven beers on tap to quench your thirst while you chill to the sounds of DJ Larue providing haunting tunes and possibly a few horror flicks on a three-sided 50 foot screen. So where do ghouls go for more info? To the Web, of course - www.downtownphoenix.com/zombie. The event promises haunting memories and ghoulish good times for all ages - alive and beyond. Festivities kick off at 2 p.m. and wrap up around 10 p.m.
Where: Heritage Square and Science Park, Downtown Phoenix. 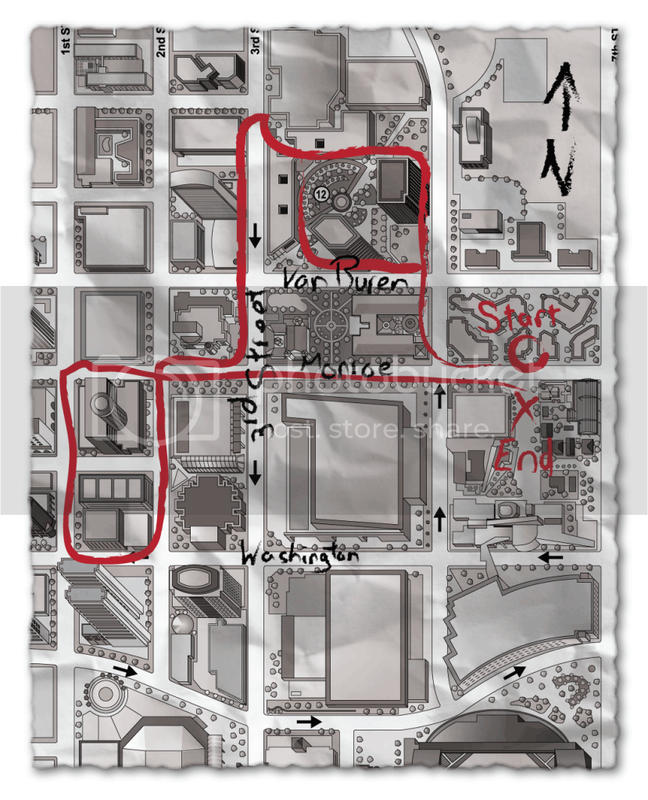 Walk meanders through the Downtown core. For all your costume needs, visit Easley's Fun Shop. Clean up provided by CareScape. Check back for updates and details on parking at www.Downtownphoenix.com/zombie. As Arizona's only true urban core, Downtown Phoenix brings together the best the state has to offer in culture, innovation and experience. Arizona's Urban Heart encompasses at once, the presence of world-class sports, arts, business, education and living, expressed with all the diversity Arizona has to offer. The Downtown Phoenix Partnership is a non-profit organization made up of property owners located in Arizona's Urban Heart, between Fillmore to south of Jackson Streets and Third Avenue to Seventh Street. The Partnership provides enhanced municipal services within this area including the management and marketing of Downtown Phoenix. For more information, visit DowntownPhoenix.com. The Partnership can be reached at (602) 254-8696. The Arizona Ghostbusters represent a costuming fan club bound together by our mutual love for the Ghostbusters license in all its forms and the personal pride and accomplishment that comes with volunteering. Our Ghostbusters costumes allow us to draw extra attention to many well deserving Charities. The smiles and joy that our costumes generate help us give to the community and put great meaning into our group. The Arizona Ghostbusters can be reached at 602-550-7016. We are an elite organization dedicated to the preservation of human life and the extermination of all zombies! Last edited by jettajeffro; 10-09-2011 at 07:26 PM. The parking garage at Arizona Center is ready to go for the Zombie walk. The $5 rate will take into effect at 8 a.m. until 10 p.m. The Zombie Walk was a huge success. We'd like to thank all of the members of the Downtown Phoenix Ambassadors, Department of Zombie Defense, Heritage Square park, the bands, the vendors, and most importantly all of the zombies. We'll have final numbers on what was raised for St.Mary's Food Bank soon. The earliest attendees numbers are looking to be almost 4000 zombies. Double from last year's walk.